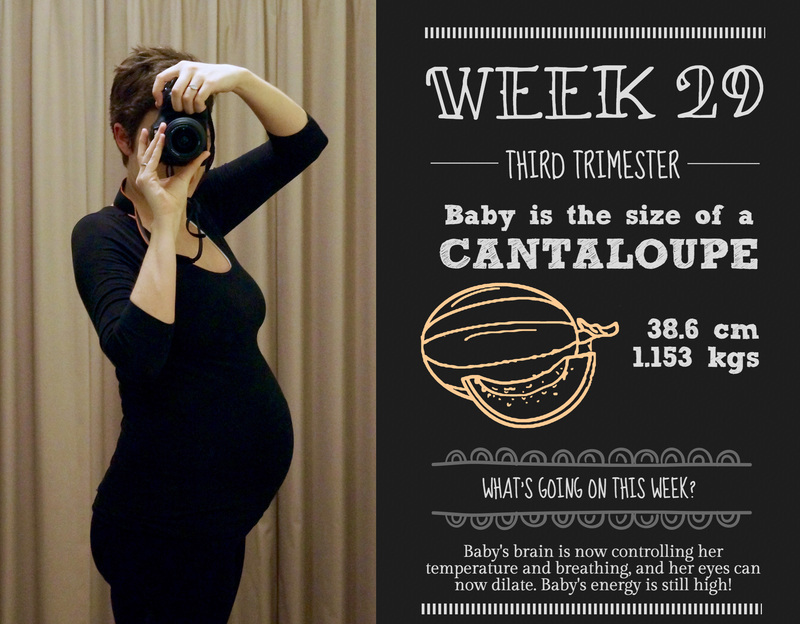 Baby: A cantaloupe (or if you’re an Aussie like me, a rockmelon) – back to the fruits! My stomach is helpfully taking cantaloupe shape as well this week, I’m starting to look very round! What I’m cooking: A baby with energy, extra fat, dilating pupils and self temperature regulation! She’s getting to a proper size now, and I’m feeling every gram of it at the moment. Main symptom: Ergh, don’t even talk to me about symptoms. My body seems to have decided to completely fall apart this week, and I’ll be visiting the GP in the next couple of days to rule out anything serious. More detail in my extended rant below. What’s on this week: The start of the prenatal classes, and hopefully a result on my glucose tolerance test! Also, this is the last week of my 20s…in the pregnancy department, anyway! Well, this week kicked my arse. I mentioned last week that I was having some rib pain, mainly when I sneezed or coughed. This week it has not improved. I’ve also picked up hayfever, so the sneezing has come in with a vengeance, meaning I’m in complete agony multiple times a day. Add picking up a cough with that, and the new inclusion of hurting when I breathe deeply, and basically I’m a whole bag of whinge at the moment. I mentioned the pain to a colleague at work a couple of days ago, and she told me to get checked, in case it was pleurisy, which is what she had when she was pregnant. I looked it up, it sounds horrible, but also very similar to what I’m currently experiencing. It’s basically a precursor to pneumonia, but should be able to be treated with antibiotics. I’ve booked in to see the doc on the weekend to rule this out, but he’d better give me something, or I might just have a breakdown in his office. So, other than writhing in pain for most of the week (and telling anyone who’ll listen), I’ve also been off with Mr Nester to the first antenatal class at the hospital. It was, in a word, intense. While the midwife who took the class was lovely, the topic of the first class was labour, and they certainly didn’t pull any punches. I think she said the word “pain” about 50 times. Now, I get it. It’s going to hurt. But frequently mentioning how hard it is, and how it’s the worst pain you’ll ever experience, and then saying: “but don’t be scared”, isn’t that comforting. I would really rather spend the time learning pain management techniques and strategies, rather than watching a doll pop out of a bag with a placenta stuck on the end. We were also told about pain relief options, starting with sterile water injections (for back labour), and progressing to gas, morphine and then the epidural. I can’t say I was a fan of the side effects of either the morphine or the epi, but I’m certainly not ruling them out (considering how much pain I’ll apparently be in!). The pinnacle of cringe for the night was the midwife asking all the couples to dance together to “I am Woman, Hear me Roar”. God, kill me now. We of course watched the obligatory birth video, at which Mr Nester and I both turned into complete children as we both lost it at the bizarre name the woman had given her new baby. Call it nervous tension. So, fear and sickness in the Nester household this week. I’m really hoping that next weeks brings some relief from all of these symptoms. Even more exciting, next week is the last week of term, so I’ll have two weeks to recuperate after that. I just have to get through those 5 days!